Welcome home to your new executive golf course home that rests on the 7th Fairway of Tiger Point East. This custom built all brick beauty has beautiful views of not only a prestige green golf course but some of the most beautiful blue waters of the sound. The open spacious floor plan is felt immediately upon entering, with a 2 story foyer and hardwood flooring. French doors lead to the home library that has a built-in bookcase and computer credenza. The cook of the family is going to be delighted with the updated kitchen that features all stainless steel appliances, an island with a brand new Jenn-Air gas cook top, double oven/convection, walk-in pantry, an ample amount of storage and a writing desk. The great room, kitchen and master bedroom overlook the sparkling pool and the golf coursWelcome home to your new executive golf course home that rests on the 7th Fairway of Tiger Point East. 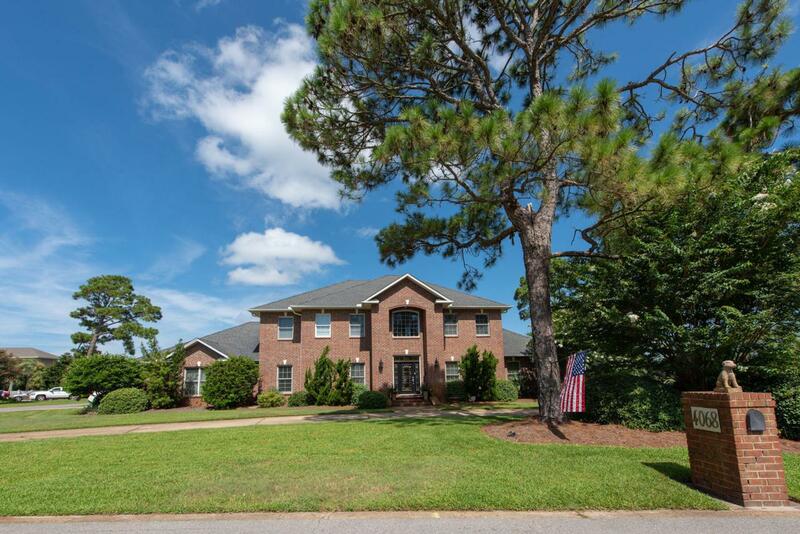 This custom built all brick beauty has beautiful views of not only a prestige green golf course but some of the most beautiful blue waters of the sound. The open spacious floor plan is felt immediately upon entering, with a 2 story foyer and hardwood flooring. French doors lead to the home library that has a built-in bookcase and computer credenza. The cook of the family is going to be delighted with the updated kitchen that features all stainless steel appliances, an island with a brand new Jenn-Air gas cook top, double oven/convection, walk-in pantry, an ample amount of storage and a writing desk. The great room, kitchen and master bedroom overlook the sparkling pool and the golf course. In the Family Room you will find a projector and screen for those family fun movie nights or those big game days. The Crown molding, 10' ceilings, and surround sound, add a nice touch. The Large master suite is highlighted by a huge walk-in closet with built-ins that is sure to please the lady of the house. Bonus room/5th bedroom is on the 2nd floor and is a perfect getaway for the kids, teenagers, or even the big kids that might enjoy watching ball games and entertaining! The other 3 bedrooms upstairs are oversized, one with a private bathroom, and the other 2 bedrooms have a Jack n Jill. The Large custom swimming pool has an enclosure with a new screen. This home was meant for a family that likes to entertain. Enjoy watching friends and family swim while cooking in your outdoor kitchen with built in stainless steel grill, a big green egg smoker, and a wood burning fireplace. The brick bar and large lanai make this backyard even more inviting. Your new home sits on a corner lot, with an oversized 3 car garage and circle drive for extra parking. This home also has Kolbe windows and 2 new HVAC units. Call today for your private tour. You don't want to miss this one.